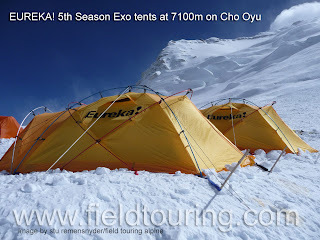 FTA Cho Oyu Expedition 2011 - On to C2! Ben dropped this voice dispatch yesterday with the great news that the team had spent a night in C1 and that Sophie and Siddhi were planning on making a run to stay at C2 if all went well! Ben called in from ABC along with Keith and Ratna and it sounds as if the team is back on schedule with the route being pushed through the first ice fall and perhaps even to C2 by today! After another short rest Ben will push with Keith to C2 and with nights in C2 the team will be then ready to mount a summit bid. I am sure in the next day or so we'll have lots more news about the progress of the team so stay tuned! FTA Cho Oyu Expedition 2011 - C1 Established! I had a good talk with Ben in ABC today and the team is doing very well having made the first carry to C1 yesterday and planning on a move to C1 for the night tomorrow. They have had a bit of snow every day but the winds have subsided so they are able to move about without any trouble on the hill. The forecast is for low winds and continued minor precipitation each day with the 27 and 28 looking quite a bit more clear. Ben has also dropped a voice dispatch with the latest updates from ABC. Enjoy listening in! Ben called in from IBC late yesterday to let us know that he had just successfully completed evacuating one of our members who had come down with suspected HAPE in the early morning hours of the 21st. She is already at this time back in Kathmandu and feeling much better. The rest of the team in doing well in ABC and waiting for Ben and Siddhi to return. At around 4 am Pille awoke with a productive cough and poor presentation and Ben took immediate steps to ensure she got down to CBC as fast as possible. 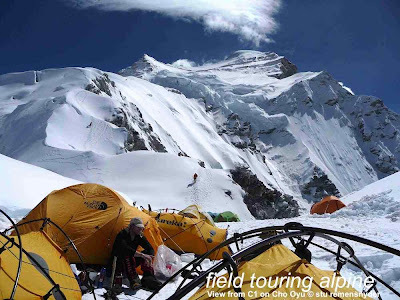 At that time in the morning there are few options and so Ben and Siddhi and Priit put considerable effort into carrying and assisting Pille out of ABC and all the way down through IBC to CBC. 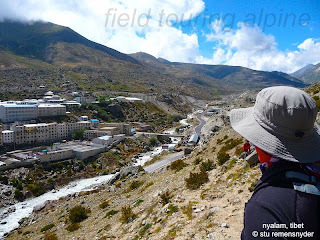 From what Ben shared it sounds like Siddhi carried Pille on his shoulder for a considerable portion of the evacuation giving further testament to his enormous strength and endurance. Thanks Siddhi! Ben said that as Pille descended her condition improved markedly and she was under her own power by the time the reached CBC. 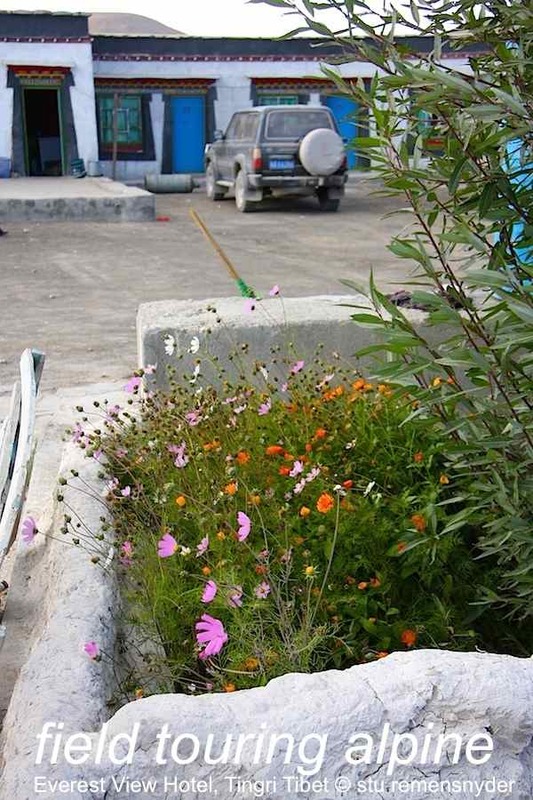 After arriving at CBC a 4x4 jeep was arranged and Pille and Priit headed to the border which they reached by the end of the day. Pille remained on oxygen throughout the evacuation as well as during the drive back to the border. One of the challenges of the drive is that one has to reascend on several passes and with no way to avoid that the best one can do is have oxygen as a precaution.Today they completed the trip back to Kathmandu and are resting up at our team hotel for a few days. Ben and Siddhi will both be back in ABC today and the team will get back to the work of moving gear and tests up to C1. Obviously both Ben and Siddhi will need a bit of rest after the effort to go all the way down to CBC and back to ABC but Keith and Sophie should be able to move on up to C1 with a carry in the morning. We'll have word from ABC in the next 24hours about the re vamped schedule and share that in our next dispatch. We are sorry to have Pille and Priit have to leave the team as they were strong and positive members. They have some time ahead of them and our agent Nima will be helping them to arrange an alternative adventure once they have rested up and made a decision about what to do with their time. High Altitude Pulmonary Edema (HAPE) is a medical condition in which fluid builds up in the lungs and blocks the body from bringing new oxygen into the blood stream causing a state of hypoxia. In some cases it can be severe enough to be fatal but typically with a rapid descent of several thousand feet the situation resolves and the body begins the process of reabsorbing the fluid that was building up in the lungs. There are numerous signs and symptoms we look for in a suspected HAPE case and they can include a productive cough (progressing from clear to pink), lack of recovery after resting, cyanosis, breathsounds that have a gurgle or rattle to them and more. HAPE can present much like a chest cold, asthma or pneumonia but at altitude any difficulty breathing is assumed to be HAPE until otherwise proven. Causes are varied but even a person taking good care to acclimatize on a reasonable schedule can succumb to HAPE. The treatments can included hyperbaric chambers and medications (niphedipine, dexamethasone, diamox and oxygen the most common) but there is nothing that is more important than a rapid descent. For some people this may be as little as 1000-2000ft but for others it may mean 4-5000ft or even a return all the way to see level. In our case the drop from ABC (5700m) to CBC(4900m) was approximately 800m or 2640ft and this was sufficient for symptoms to begin to subside. In some cases climbers will feel considerably better after a few days down low and consider ascending again. This is obviously accepting a large degree of risk of contracting HAPE again but there are numerous cases of this happening even on 8000m peaks. 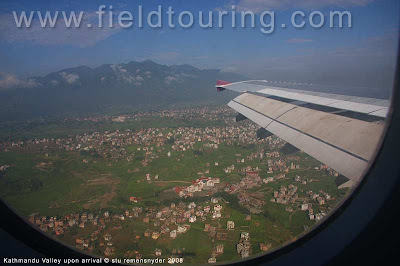 For most people it makes best sense to stay where the air is thick and enjoy the Terai in Nepal, the Ganges and Varanassi in India, or the beaches and rock climbing in Thailand! Ben has dropped a voice dispatch from ABC at 5700m (see below). Everyone is doing well and they are well on schedule at this time! Sounds like the plan is to make a first carry to C1 tomorrow and officially get the climb under way! C1 is situated in a small bowl and in busy years fills up quite a bit. With a small number of teams this season we shoul have the pick of spots. As it is very windy there it is often avisable to set the tents down lower in the bowl despite losing the nicer views from the balcony above. In the image above you can see where FTA placed tents in 2008 (lowest group of yellow tents with people hovering about) and where some other teams had tents up higher (farthest away). In 2008 there were many tents destroyed and even blown off the mountain in the upper sections during a particularly fierce wind storm. Meanwhile those in the protected area came away with some damage to a few tents. Always a difficult choice between views and safety though as you can see in the image below that our view was still quite nice! 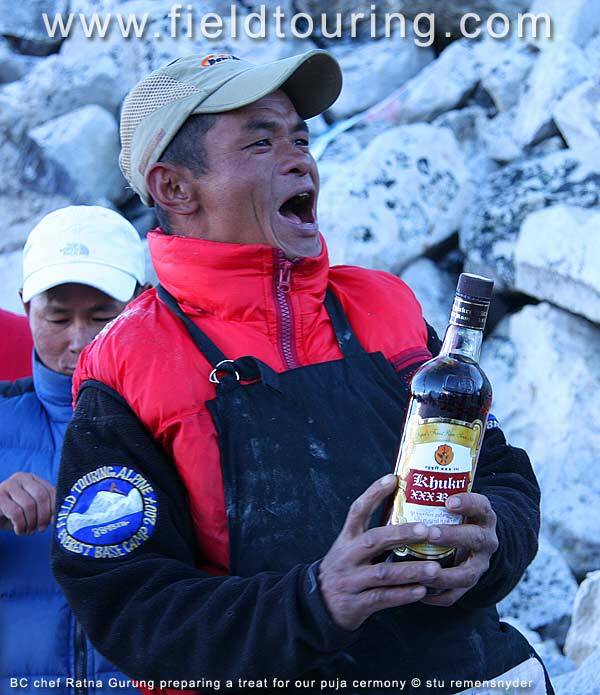 FTA Cho Oyu Expedition 2011 - In ABC and all well! Ben Kane just called in from ABC where he and the team are all settled in for the night after a good hike up today from IBC. They have made very smooth progress and did not need any additional days in CBC to arrange yaks as they caught the first "train" out of town. The last soft bed for a month! Apparently the yaks this year are a bit thin after a long winter and are not carrying the weight they usually do so.... instead of 17 burly yaks with 60kg each we ended up with 32 hungry yaks with 35-40kg each to carry our gear to ABC! 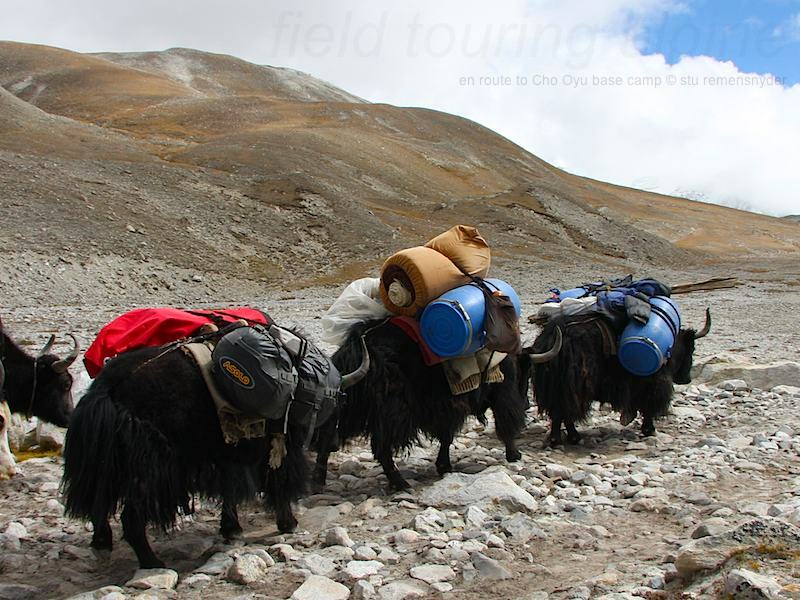 Ben noted that all of the teams loading up yaks were having the same challenge and the upshot is that a lot of money had to change hands from expeditions to yak drivers! 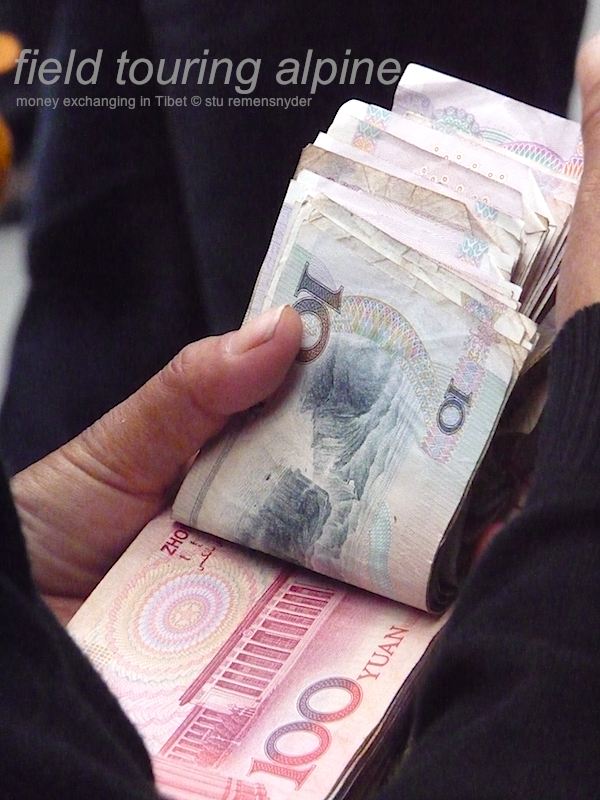 After much debate and persuasion Ben was able to reduce our debt by a third but it still amounted to more than 1000usd. 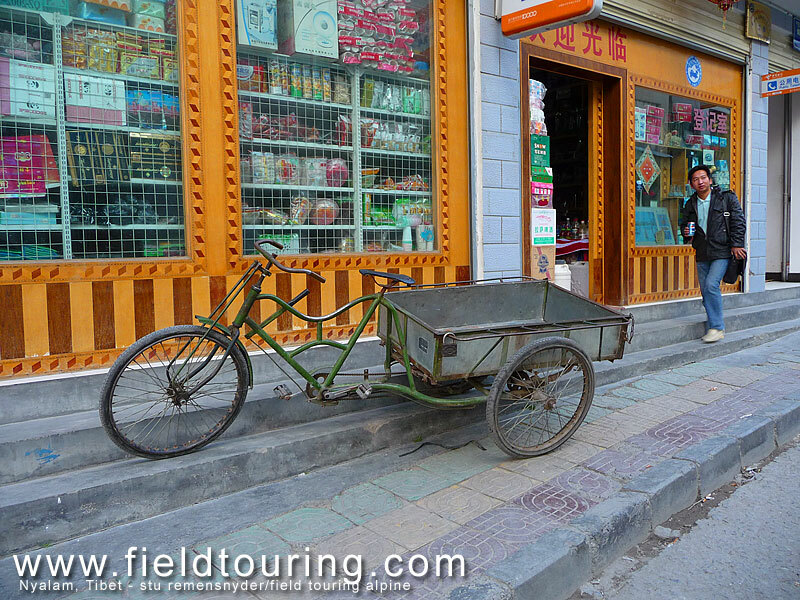 Additional expenses are quite routine on a Cho Oyu expedition and we budget for it each time. With fewer teams on the hill this spring we had no option but to bring sufficient rope and gear to fix the route and as such we are a bit heavier than usual. Beyond this our heated ABC tent requires more fuel and all this adds up. At this time we have 1000m of rope in BC and an additional 1000m in IBC (along with additional fuel) ready to come up if we need it. Ben said everyone is feeling very well and looking forward to a great rest day tomorrow. They are predicted to have excellent weather at ABC with sun and light wind down low. High on the hill the winds will be raging at over 100 km/h during this clear spell so they are likley to be treated to horizontal plumes of clouds and snow coming off the top. Our ABC setup this season includes an insulated floor and a heater and the team is enjoying the warmth and comfort they provide in the mess tent. Our chef Ratna will be serving up great food for them and also providing the right ambiance for a members lounging at BC. Ratna becomes the social center for our trips as there is no better place early in the morning than his cook tent with hot milk coffee, music and conversation. The sherpas and members from other teams will end up in Ratna's tent during the expedition and it is a place to make friends, get the latest news, talk over strategy and get the day started right. Out of his kitchen will come popcorn, french fries, soups, pastas, pizzas, momos (tibetan dumplings), curries and much more and i have yet to see another expedition eat better food than what Ratna prepares. He takes tremendous pride in making great food and does so with flare and panache. 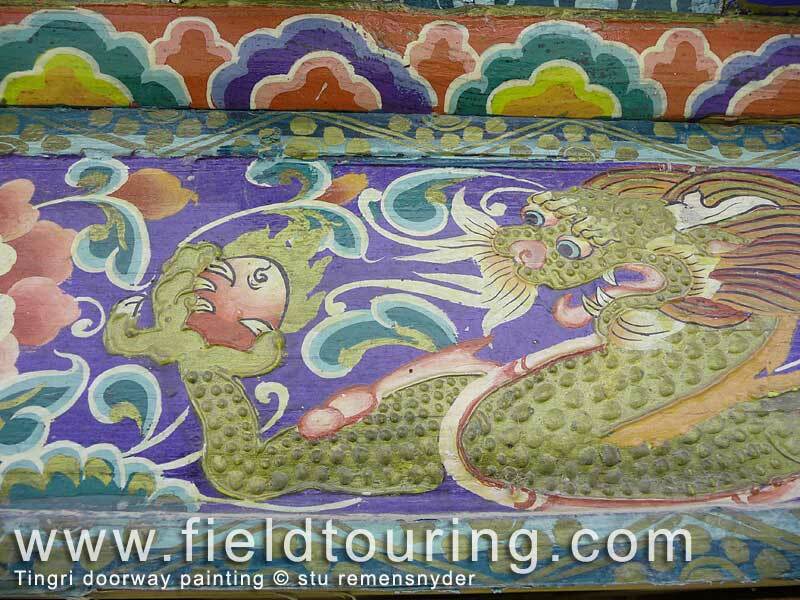 I hope you all get a chance to join Ratna on one of our trips and see it first hand for yourself! The reality is that Ratna's ability to provide good food to our members is crucial to their ability to do the hard work of the climb ahead. They will be burning upwards of 5000 - 6000 calories a day and lucky if they can jam in 4000 calories a day. The more they can close that gap the stronger they will remain and the better a chance they have up high (where the gap is always widened on a summit push!). Typically members will lose between 5 and 10 KG (10-20lbs) but for members who can maintain a healthy appetite - and avoid GI illness - it is possible to keep that loss to just 2-3 kg. We'll look forward to watching the progress in the coming days and Ben will be calling in every few days to give us the latest! 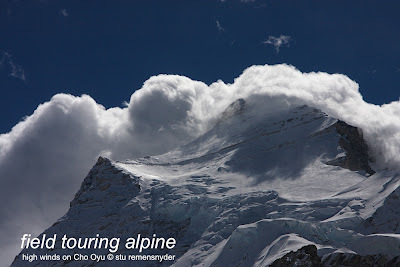 FTA Cho Oyu Expedition 2011 - In Tingri! Ben called in yesterday from Tingri to let the home team know that all is well for our group. They have used the days in Nyalam and Tingri to acclimatize and they have all hiked to 5000m and are feeling well. 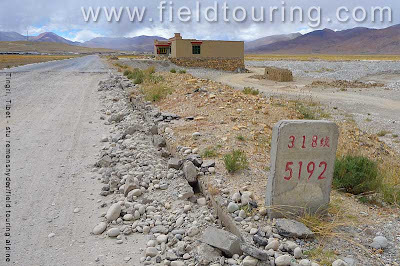 The hikes on the hills near Tingri are dry and desolate and by this time they are all wearing some sort or protection from the ever present dust. 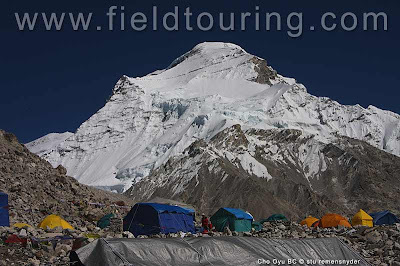 Nonetheless the views are astounding of Cho Oyu and the valley below and the sensation of nearing the worlds 6th highest peak is no doubt beginning to get everyone very excited. After their last, and mercifully short, drive today our team will finally get under their own leg power and begin the expedition proper. 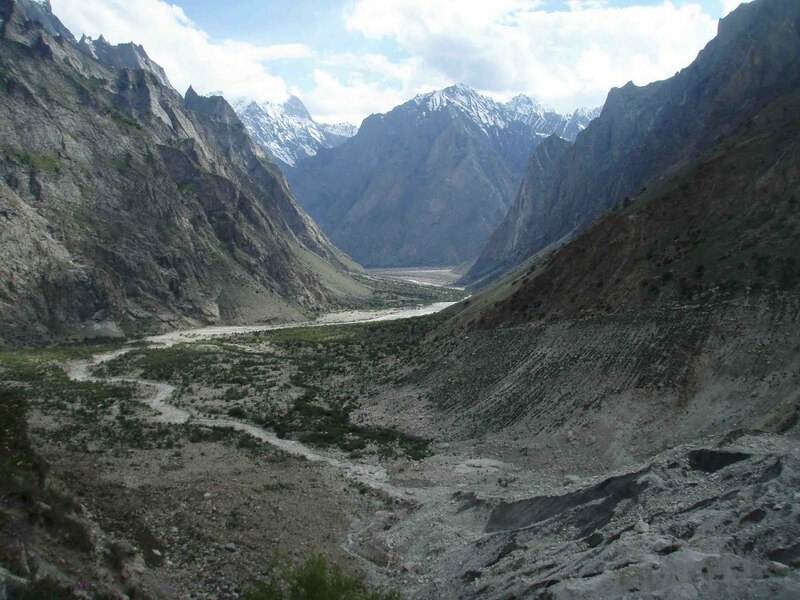 On the 16th they plan to drive from Tingri to Chinese BC where they will be for one or two nights while the Yaks are arranged to transport the mountain of gear to the Advanced Base Camp. 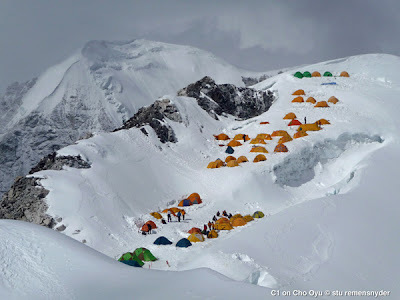 They will have one night on the way in at Intermediate Base Camp and will good luck will arrive at ABC on the 19th or 20th. Even as our Cho Oyu expedition is getting under way we are making preparations for this summers K2 BC Trek and climbs on Spantik, Broad Peak, K2 and Gasherbrum II. We have limited spaces available on all 5 trips so let us know if you are interested! 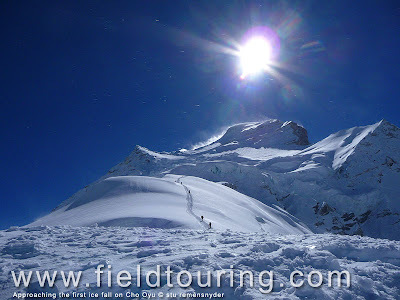 We are also taking applications for trips in the autumn including Island Peak, Everest Base Camp, Satopanth, Cho Oyu, Ama Dablam and Khumbu Peaks and Passes. 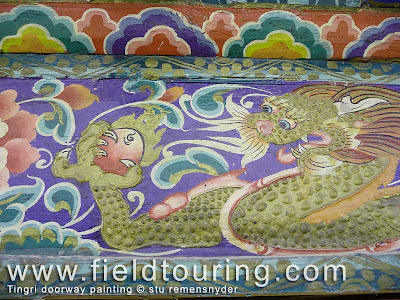 Have a look at all of our offerings at www.fieldtouringalpine.com or drop us a note at "info@fieldtouring.com" ! 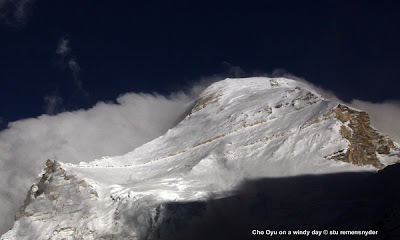 FTA Cho Oyu Expedition 2011 - In Nyalam! We're all here in Nyalam, Ratna and Siddhi arrive late this afternoon with all of our luggage that took a bit of time to come through customs. We are heading up to Tingri tomrrow morning and with fingers crossed we will get a great view of Shishapangma. 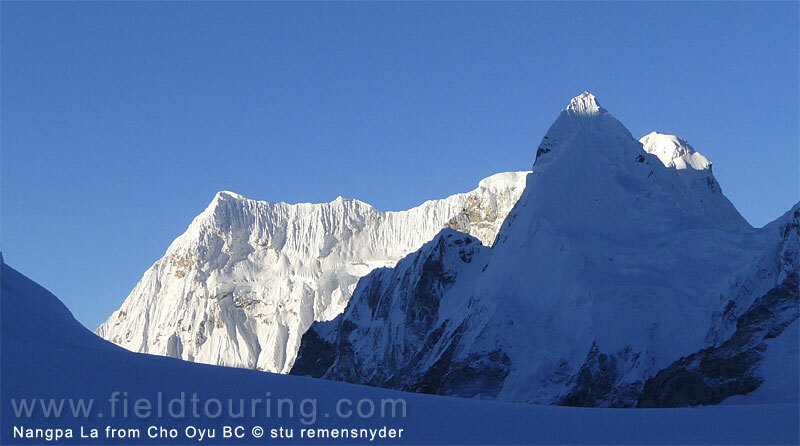 In 2008 we had an amazing view of this mountain, and the fact being it is the lowest of the 8000 metre peaks does not in anyway take away from its grandeur. Today we all went for a brief hike, just to get a bit of height gain. It has been snowing lightly since we arrived yesterday, so no views, but just good to get out and stretch the legs. 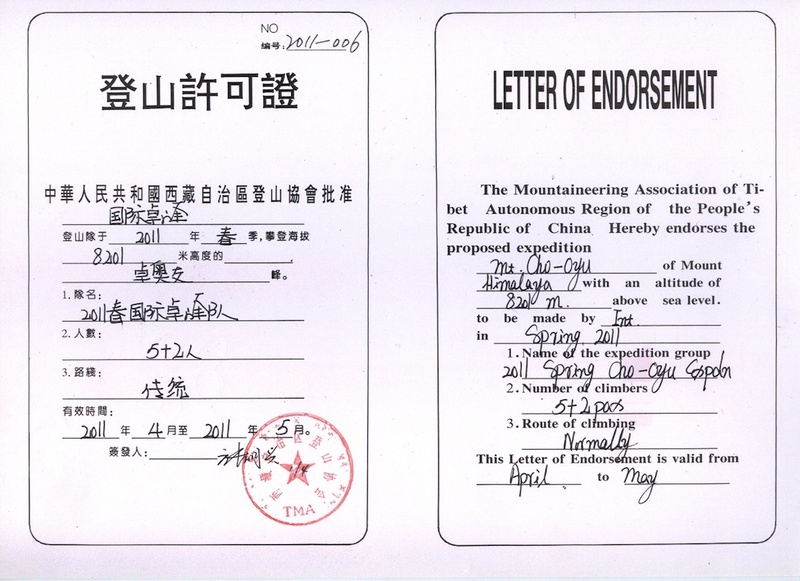 FTA Cho Oyu 2011 Spring - Permit Issued!!! Permit in hand for Cho Oyu!! Exciting news!!! 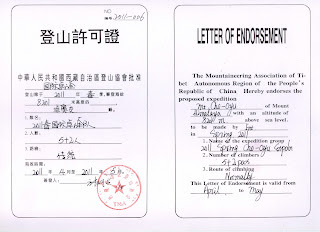 We have just received the climbing permit for our team to go to Tibet and this is a huge step which we always wait for with great anticipation! Climbing Cho Oyu is not like many peaks around the world where you show up with a rucksack, check in with a ranger and off you go. To go to Tibet and climb requires months of lead time to give the Chinese and Tibetan authorities proper documents for your full team, arrange visa applications and be ready to go with the local arrangements of hotels, 4x4 jeeps and private vans. 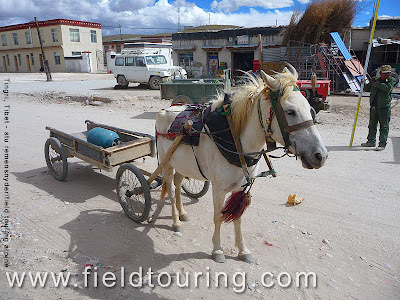 Then there is the gear for our team which includes solar panels, a battery and the accessories for using it to charge all manner of things from radios to ipods. Then mountain equipment for fixing the route including in our case 2000m of 8mm fixed line, dozens of snow stakes, pitons and ice screws not to mention enough stoves, tents and gas cannisters to effectivelt serve our members. Finally a few days before the trip is to get off it all comes together in hotel rooms and storage rooms in Kathmandu and all of this gear plus our members and staff will load up this gear onto a large truck and head up the border of Nepal and Tibet where the Friendship highway starts its improbable journey though the wedge created through the Himalaya over the millennium by the Bhote Kosi River. Along the way they will pass the "Last Restort" and be tempted to go bungi jumping (not likley to have the time!) We usually stop there to have a look at one of the deeper jumps in the world and it is enough just to contemplate it for most people! The border town of Kodari is a hustle and bustle kind of place with heavily laden trucks lined up in both directions and a small set of hotels looking out over the river. We often try to come in the night before we are to cross the border to ensure we are first at the crossing in the morning! It is a way to avoid staying in the Chinese border town of Zhangmu which is a serpentine village in which one imagines growing up not knowing what a straight line is! After crossing the bridge and entering Tibet proper the name of the river becomes the Rongshar Tsangpo and the very preciptous ride begins. There is no doubt that this portion is one of the most gut wrenching and unnerving parts of the journey to base camp. At the start one looks down at the abyss to the left and feels the vehicle swaying like a drunken yak and it seems for all the world that the jeep would need but a small push to upset the precarious balance. I have made the drive twice and recall each time starting out gripping the handle bars so tightly that blood ceased to flow to my fingers. At some point however your give in to the inability to control anything and actually begin to enjoy the close up views of the vertical drop and simply let go of earthly concerns. 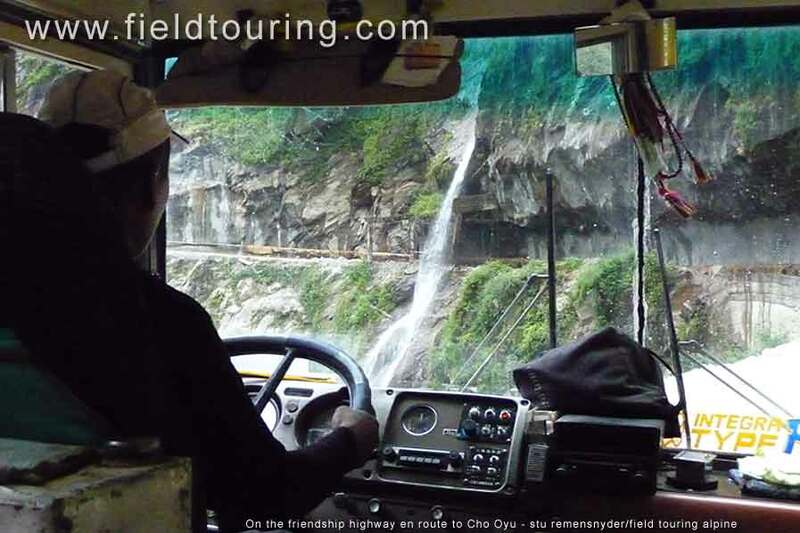 Just as you finally give in and begin to enjoy the ride you crest out of the gorge and pull into the dusty town of Nylam and get a welcome respite from the road with a night at the Snow Lion Inn! We'll enjoy watching our team make their way to Nyalam and be sure to share more of the journey to base camp in upcoming posts!